Subedar Sujjan Singh was born on 30th March 1953 in Kanina Khas village in Bhiwani district of Haryana. Son of Shri Mangat Singh , Sub Sujjan belonged to the family of farmers. His initial education was at home but later he went to the state high school and studied up to class VII. During his school days he had great interest in sports and specially loved playing hockey. Sub Sujjan Singh was fascinated by the army life and soon joined the army before completing his school education. He was recruited into the 13th battalion of the Kumaon Regiment, a regiment known for its gallant soldiers and various battle exploits. 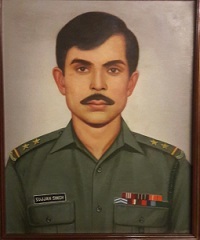 During 1971 Indo-Pak war, he along with his unit was deployed in the Logewala region in Rajasthan and the unit received the theater honour for its valour and service. The then Hav Sujjan singh got promoted to the rank of Nb Sub on 01 Aug 1991 and got posted to 20th battalion of NCC Kolkatta. 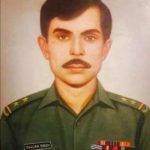 After completing his tenure in Bengal he was promoted to the rank of Subedar and returned to his parent unit of 13 Kumaon. During 1994 his unit was deployed in J & K area engaged in anti-insurgency operations. 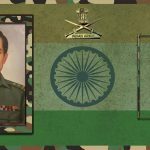 On 26 September 1994, Sub Sujjan Singh’s unit had received credible inputs from intelligence sources about the presence of a group of militants in Zalurah village of kupwara district. A search and destroy operation was launched to flush out the terrorists from the jungles who were waiting for an opportunity to attack the security forces. The assault team of the unit immediately cordoned off the target area and began searching the dense forest. Sub Sujjan Singh, as search party commander spotted two hideouts. As Sub Sujjan began moving closer to the hideout , the terrorists spotted them and started firing at them. Realizing the search party in a difficult situation, one of the officers along with some soldiers moved towards the terrorists, to divert their attention. However Sub Sujjan Singh feared that the officer along with the men were heading straight into the jaws of death. Not caring about his life, Sub Sujjan charged at the terrorists through a hail of bullets. Although he received a barrage of bullets, he continued to advance ,firing from his rifle. As the terrorists focused their attention on Sub Sujjan, the other soldiers of his team were saved and got time to position themselves at vantage points. Sub Sujjan kept firing relentlessly at the terrorists till the last bullet in his rifle. 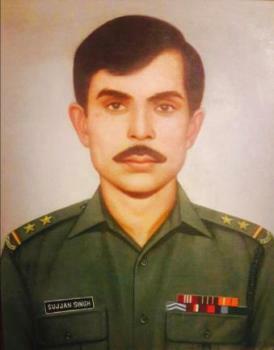 He got severely injured with enemy bullets piercing his helmet and head and later succumbed to his injuries. Sub Sujjan was martyred but his daredevilry and determination inspired the other team members to avenge his killing. The operation was eventually successful and all the militants in both hideouts were killed and a large quantity of arms and ammunition was recovered from them. Sub Sujjan Singh was given the nation’s highest peace time gallantry award ” Ashok Chakra” for his conspicuous courage, indomitable spirit and supreme sacrifice. Subedar Sujjan singh is survived by his wife and a son. On 26 Sep 1994, 13 Kumaon was deployed in Kupwara district (J&K).The unit received information about few terrorists hiding in the jungles near Zalurah village. Unit immediately cordoned off the target area and began searching the dense forest. Sub Sujjan Singh, as search party commander spotted two hideouts. He tactically began moving closer. Short of the hideout ,terrorists started firing which made move extremely difficult. Seeing the search party in a difficult situation. One of the officer along with some men moved towards the terrorists so that their attention gets diverted. However Sub Sujjan Singh feared that the officer along with the men were heading straight into the jaws of death. Not caring about his life, he frontally charged the terrorists through a hail of bullets. Although he received a burst of bullets, he continued to advance ,firing from his rifle. However a bullet pierced his helmet and head and he succumbed to the injury. For this utmost conspicuous and act of daring valour, Subedar Sujjan Singh was posthumously awarded Ashok Chakra.